The original Eclair ACL high speed motors (75 fps motors) only have crystal stability for speeds of 24 and 25 frames per second (fps), which are set by a crystal oscillator. Speeds of 8, 12, 50, and 75 fps are each set by an RC circuit and are not crystal. Our control is designed to make each speed crystal and increase the range of speeds for these motors. By using the pushbutton decimal switches, you can set a crystal speed from 2 to 79 fps in 1 fps increments. The 11-pin Fischer connector gives you compatibility with Arriflex 16SR camera accessories such as the precision speed control that allows you to set the speed of the motor in increments as small as .001 fps (e.g. 29.970 fps). 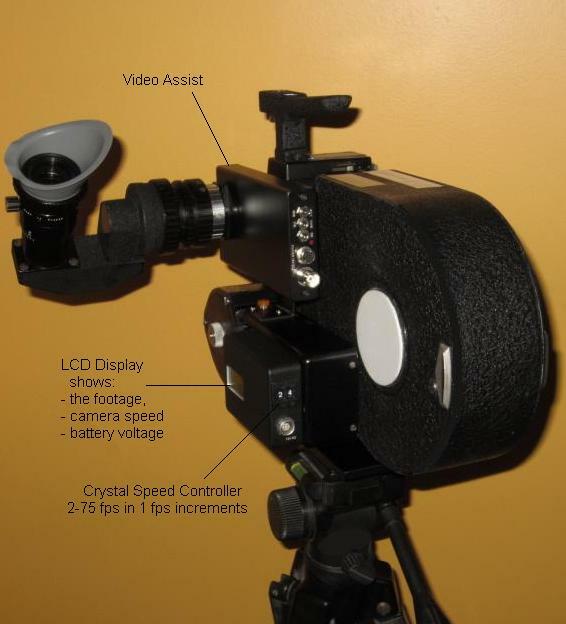 The crystal speed control with the speed selector and accessory connector can be attached to the motor or to the camera's base. We can also attach to the motor an LCD display that shows: footage, camera speed and battery voltage. Crystal Speed Control Type ACL 12-40 FPS for the Small Thomson Motor. This unit drives the motor with crystal speeds ranging from 12 to 40 fps in 1 fps increments set by two pushbutton decimal switches. It is permanently attached to the motor housing.